30th November. Posted in UX. 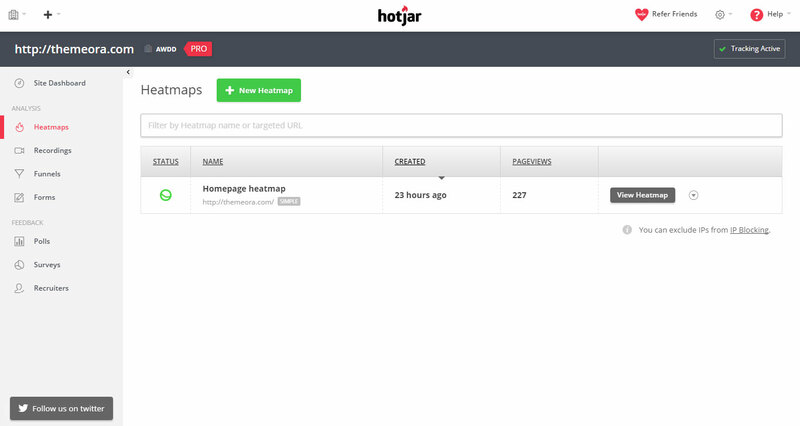 For the past couple of months I’ve been using an awesome web analytics tool called Hotjar. Hotjar allows you to do lots of very useful things that I used multiple tools for in the past, and it can make an incredible difference to your website if you use the insights that Hojar provides wisely. How much does it cost? Totally free for up to 2000 page views a day. More than enough to get vital insights into your user behaviour. You are limited to 3 heatmaps, funnels, forms, polls and surveys and you get 300 recordings of actual users interacting with your website live. If you need more, then the next package up is 29 euros per month and the package up from that is 89 euros per month. All these packages are great value for money considering how much Hotjar can help you improve your website. All the features in Hotjar are great but by far my favourite feature is the visitor recording functionality. 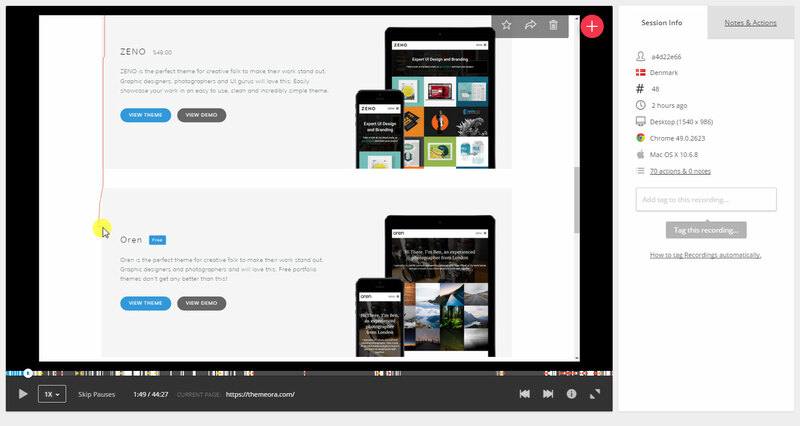 This cool feature shows you videos of the user’s screen as they use your website. It works on desktops, mobiles and tablets too. The recording will show their mouse movement, highlight clicks and allow you to speed up / slow down the video and jump to various actions such as new page visits and clicks. Hotjar have certainly got the user interface just right. It’s very clean and easy to use. From the first time I logged in it felt like I knew exactly what to do. I can’t say for sure that Hotjar have done their own extensive user testing on their website but it certainly feels like it. I’m currently using Hotjar on my own website Themeora as well as a few different client websites. For one of my clients, the first time I looked at the visitor recording it became clear that there was an issue with the website. One particular page was a category page with a list of services on. Each service had a link to a quote form and also a call to action button at the top of the page which also opened a quote form. Users were looking up and down the list of services and never clicking the button to get a quote. It seemed like they were unclear about which service to choose. My hypothesis was that if we removed the button on each service and had a visible form at the top of the page, the user could simply type into the contact form what they were looking for. This should remove the hurdle of getting them to pick a service. The services on this website could certainly be confusing because they are technical in nature and often referred to as different things by different people. I built an alternate landing page and fired up Optimizely (another awesome tool for A/B testing) to set up a test. I’ve got my A/B test running right now so hopefully, I’m right and the alternate landing page will increase leads and make my client some extra money. Give Hotjar a try and I’m sure you’ll be just as impressed as I am. There are plenty of great tools available right now such as Crazy Egg, Survey Monkey and ClickTale but Hotjar provides most of this functionality in one product. Hotjar’s simple interface makes it easy for anyone to get started, even for people with no previous experience of visitor analysis.